Update 1 January 2012: Martin O’Shea has kindly sent me two photographs and permission to use them; I have added them at the bottom of the page. Update 2 January 2012: Eleanor Russell kindly sent me four photographs of the operations of her husband’s family’s firm Russells of Portarlington, who carried timber on the canal. I have put them on a separate page about Russells. Update 3 January 2012: I don’t know why I didn’t show the photo of the Harbour Bar before …. Update 4 18 June 2018: the URL for Laois County Council’s booklet on the canal has changed; I have amended the entry below. 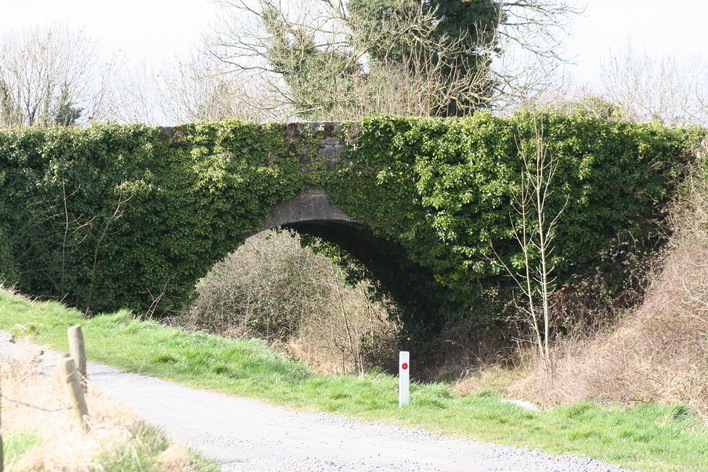 The Mountmellick Line of the Grand Canal, built between 1827 and 1831, runs from the Barrow Line at Monasterevin via Portarlington to Mountmellick. 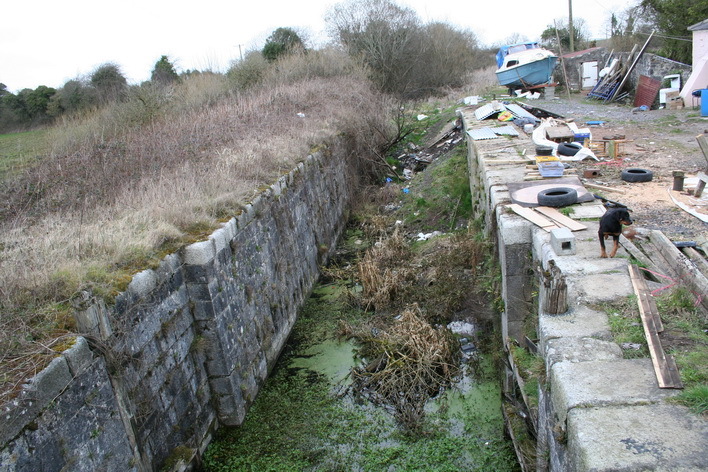 The admirable Heritage Officer of Laois County Council commissioned a survey of the industrial heritage and the environmental aspects of the abandoned canal. Then, so that knowledge of the canal might be disseminated more widely, she caused to be published a well-illustrated book based on the survey. The book can be downloaded, free of charge, in PDF form here. There is an interesting photo of what looks like a square-sterned wooden barge, employed in the timber trade. The full survey is also available via the same link. The later link to the appendices may not be working, but an email to the Heritage Officer will produce a copy by return. Laois County Council is to be congratulated on its initiative. O si sic omnes. These photos were kindly supplied by Martin O’Shea, who retains the copyright but has permitted me to use them here. Here is Blackhall Bridge on the OSI map of ~1900. On the ~1840 map it was called Moore’s Bridge. I have not, alas, been to Mountmellick for some years. I do hope the Harbour Bar is still there. I am keenly interested in canals that run through the midlands. It is such a pity that the Mountmellick Canal line was closed off and dried up. 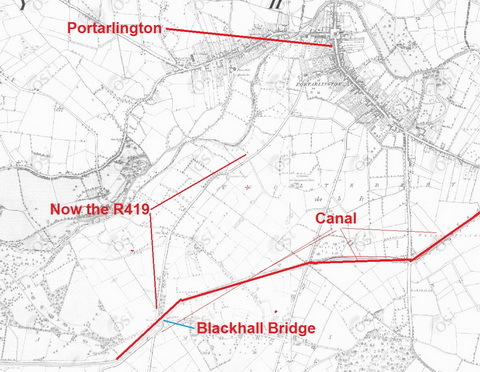 I often try to follow the route it would have taken, between Mountmellick and Portarlington and on to Monasterevan, it is intriguing to see that in some places, one can identify the actual canal bed. I work in Co. Westmeath, where the Royal Canal is still alive and well and every year there is a canal festival in Ballinacarrigy which brings barges from Mullingar , past Coolnahay, in to Ballinacarrigy Harbour and on to Abbeyshrule. One can only imagine what the Mountellick Canal line would have been like in it’s day. 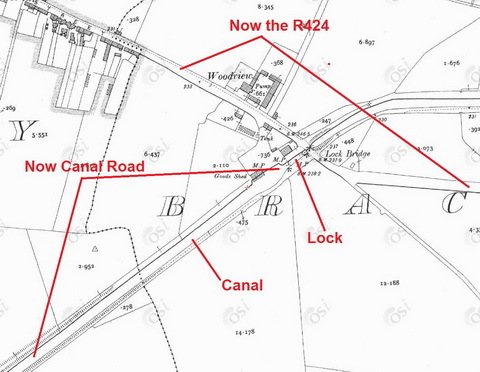 The Mountmellick Canal publication is a wonderful book and very informative, giving us a glimse of what the canal may have been like. I often wonder if it would be possible that sections of the canal could be restored where water features would remind us of how beautiful these waterways were and what Flora and Fauna they supported. Maybe someday…. 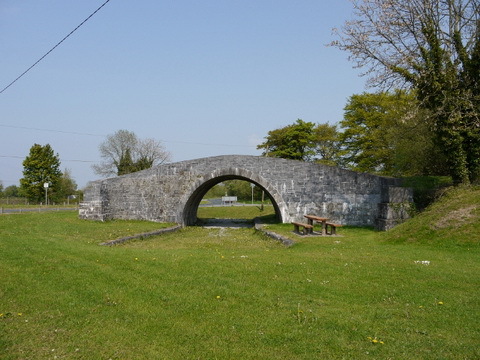 We called the canal bridge closest to Mountmellick the First Bridge. Just beyond this bridge the canal ran through some of my father’s fields. As children, we spent many happy Sundays fishing for roach and perch with rods made from hazel branches. Once, we caught a pike and an eel. Very exciting. For the roach we used flour dough mixed with strands of sheeps’ wool to keep it on the hook; for perch we used worms. We ate the roach and the perch. During the summer, the water at the First Bridge became the swimming p0ol of the town. One man, Johnny Bannon, would stand on his hands on the parapet of the bridge and lever himself off into the water fifteen feet below. The water was only four feet deep at that point. Don’t ask. He never hurt himself. When the swimmers went home we searched in the long grass behind the bushes where they had changed their clothes. Once we found a comb, a small penknife and some coins. The Travelers from local encampments also waited for the swimmers to depart and then the men swam naked. We were warned never to drink from the canal because the water was standing and people drowned dogs in it. One Sunday while fishing, we persuaded ourselves we were going to die of the thirst. No one would go home for a bottle of water. We decided to drink from the canal, but then we saw a man we knew, John Staunton, coming along the bank. We asked him would it be alright to drink from the canal. John had been in WWI. He said, “One time in Belgium I got down on my belly to drink out of a well, but I had to push a floating dead soldier out of the way first. This water won’t kill you.” But, despite John’s permission, we were too afraid to go against our parents’ commands and did not drink. We were all sad to witness the eventual fate of the canal. Just beyond OUR First Bridge, my brother has allowed nature to reclaim itself with all the plants and bushes indigenous to the area. It is now a bird sanctuary for birds disturbed bythe intensive farming of the surrounding fields. Tom: this is great: I’m delighted to have those memories. When we were kids we’d visit my father’s parents, who lived on the Curragh, and if it was a warm day we might go for a swim, which usually meant on the aqueduct in Monasterevan (Weil’s Disease hadn’t been invented at that time). The taste of the water was very distinctive (we were used to swimming in pools or in the sea) and it had a lovely soft quality. The canal plays a significant part in Tom Phelan’s novel THE CANAL BRIDGE (Lilliput Press). Info at http://www.tomphelan.net. 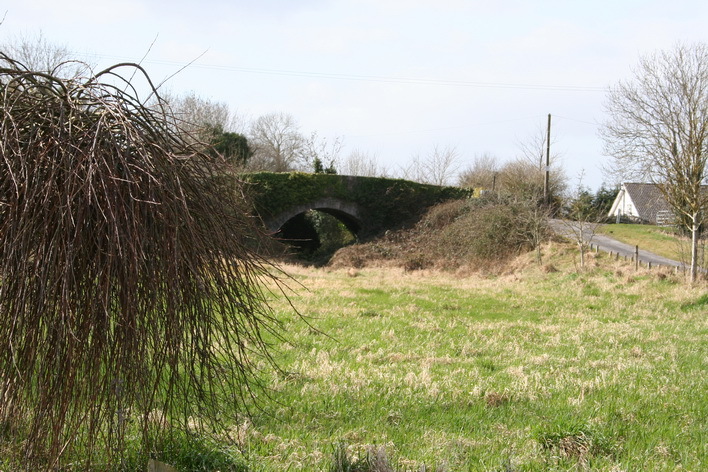 Visiting Portarlington last year I stopped to photograph Blackhall Bridge at the junction of the R419 and Canal Road (the route of which follows the now filled-in canal). This canal bridge stands in splendid isolation. It was restored by the townspeople as a Millenium project. Seeing my interest a lady living in the cottage opposite the bridge came over to talk. She had lived in the cottage all her life and remembered swimming in the canal. She was a mine of information. As I left she told me to go and see the remains of the lock at the end of Canal Road, where it joins the R424 in the town. That was also fascinating. I’m sure most car drivers using the junction don’t realise they are driving through a lock. An estate close by is named “Lough Gate”, and I wondered what the background to that misunderstanding was. My Grandad John Lanigan was lock keeper at canal house in Portarlington and my mother grew up in that house. 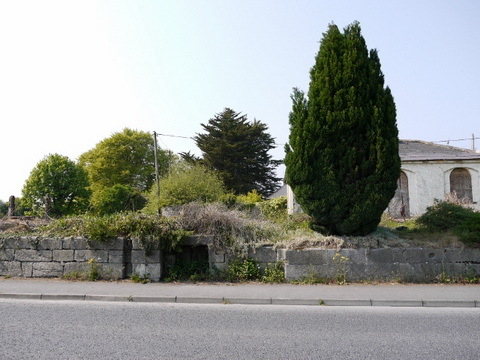 I am currently researching the family tree and my great grandad all so called John Lanigan was indeed all so a lock keeper and lived in a house in Clogrennan Rossmore which was owned by the grand canal company. I’m interested to know are there any records of them and where would I start to look? Any advive would be greatly appreciated. My name is Tony Mallen and I live here in Perth Western Australia. I am 76 years old and I am sorry to hear about the Mountmellick Line as I remember distinctly when I was in year 5 going with my fostermother a teacher from Grangecon Co. Wicklow to visit a Fr. Meagher in the catholic presbytery in Mountmellick. they gave me some books to keep me occupied. I listened in to them and one item stood out . it was the great party the Mountmellick Dockers and working folk gave to a Oliver Flanagan and carried him shoulder high,when he first won a seat to become a TD. Don’t think they were happy about an “interloper” winning but I remember I got a kick out of it. Always had visions of a vibrant harbour. Shame about the canal. Sic transit Gloria or whatever. This is all so interesting. I am first generation American. My mother is from Argentina and her Grandfather immigrated from Mountmellick, Ireland back in the late 1800. I was always told that a family member owned the “Horan Bar”. Not sure, but would love to find out. It was closed 2 years ago when I visited and inquired. Apparently there had been a recent fire. Anyone able to lend any info., it would be greatly appreciated! Thank you, loved reading about the railroad/bridges too. Hi, my Dads uncle was the lock keeper at Tinnakill lock and my granny grew up there. Willie my dads uncle didn’t move out of the cottage until the early 80’s. The house still stands there becoming more derelict but there is no trace of the canal. My dad has lots of stories from his mother growing up at the lock. I’m trying to source old family photo’s of the canal in use at the house. If I find any I will send them on. Do you know where I could look to find historic photo’s of this streach of the canal? Nice to hear from you. Do try and record your dad’s stories, if you can: we need all the history we can get! The Laois County Council booklet has a few old pics; the URL has changed to https://www.laois.ie/wp-content/uploads/Mountmellick-Canal-Laois.pdf and I’ve updated the link on my webpage. Other than that it’s a matter of (a) asking locally (perhaps with a letter to the local papers) and (b) searching the internet, bearing in mind that there may be variant spellings, eg Tinnekill/Tinnakill. I am trying to do some family research. 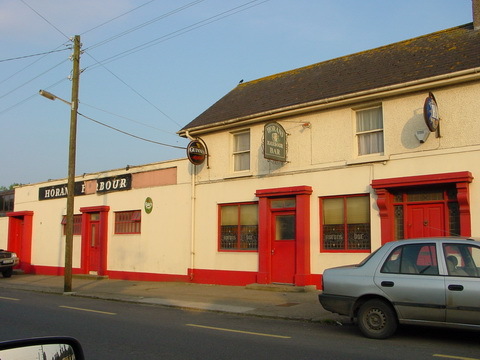 My grand-mother (Marion Donnelly, nee Bacon) used to own a pub (named ” The Harbour”) located “by the lock gate son the canal in Mountmellick”. My mother grew up in this pub until her late teens, when they moved to Dublin around 1927 (??). I heard that this pub burnt down at some stage (?). Would there be any information, or possibly a photograph of this pub ?